This is an uber-quick Thanksgiving post because I know that turkeys will be going in ovens really soon. I just wanted to share an idea with you that a friend shared with me years ago and I have used many times since. The idea might seem a bit radical, but is incredibly simple: Bake your turkey inside of a brown paper grocery bag. Crazy, huh? Rather than having to re-invent the wheel, I will just share this link so you can see the process. I would highly…highly, HIGHLY recommend using this method for roasting your Thanksgiving turkey. A paper bag roasted turkey is extra juicy, extra yummy. Often the turkey just falls right off of the bones. Let’s not forget that the bulk of the mess is contained in the bag. 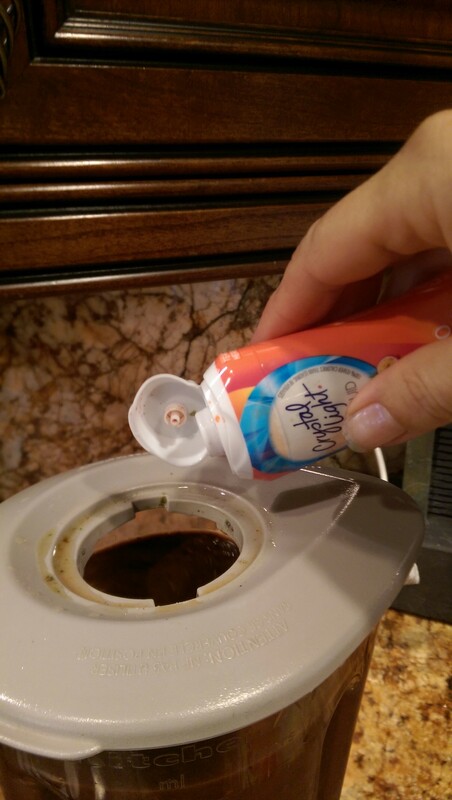 Easier cleanup on Thanksgiving? That’s a huge bonus, wouldn’t you agree? So, bag that turkey! You (and your guests!) will be glad you did! I don’t know what it is like where you live, but it is hot, hot, hot here right now! Seriously HOT! It is not quite noon and it’s already 108 degrees with a forecast of 115. Did I mention that it is hot? 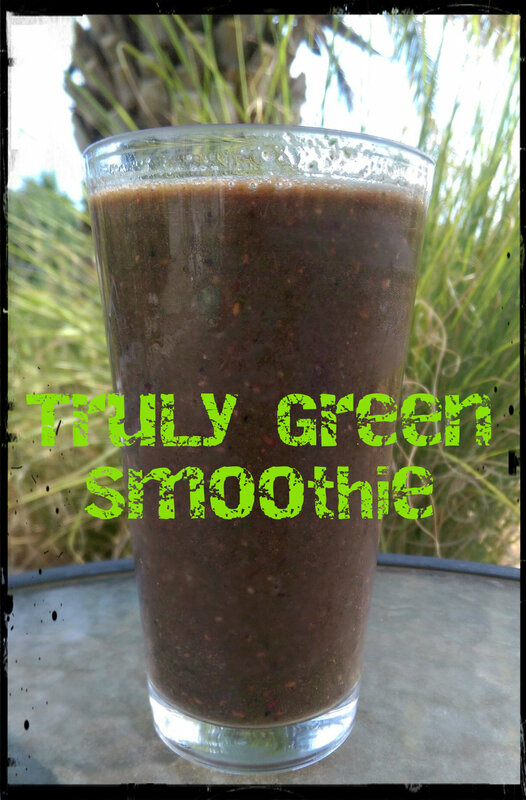 Just for fun, I thought that I would share how I make our super healthy green breakfast smoothie. 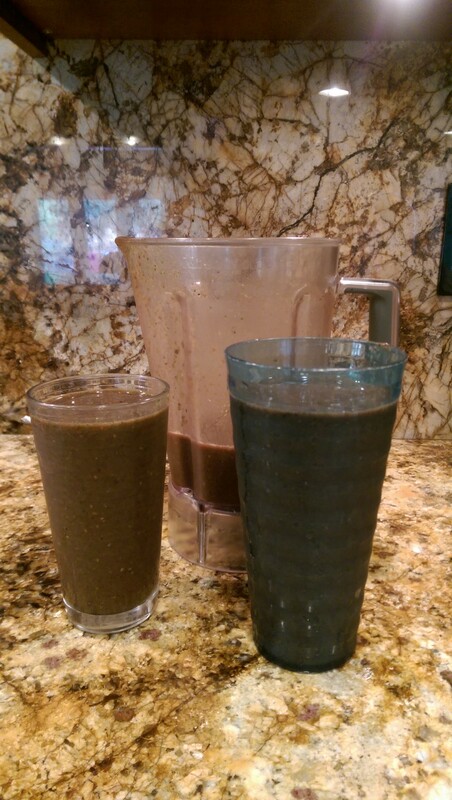 My hubby and I drink it nearly every morning. I love that it is such a quick, easy, over-the-top HEALTHY breakfast. Did you know that you can freeze salad greens? I used to keep them in the fridge and after a few days of smoothie/salad making the huge Costco bag of greens would get all slimy and I would have to sort and rewash before adding. Huge pain. I did some research and found that you can freeze greens. I never have to sort now. The texture of those frozen leaves is just awesome, just make sure that you quickly return them to the freezer because they thaw out quickly. 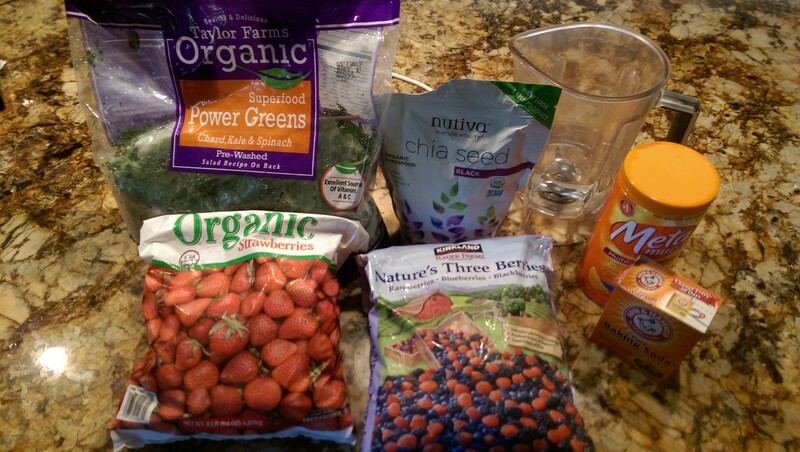 We get the Superfood Power Greens mix with Chard, Kale and Spinach at Costco. I grab handfuls and handfuls and smash it down as I add. 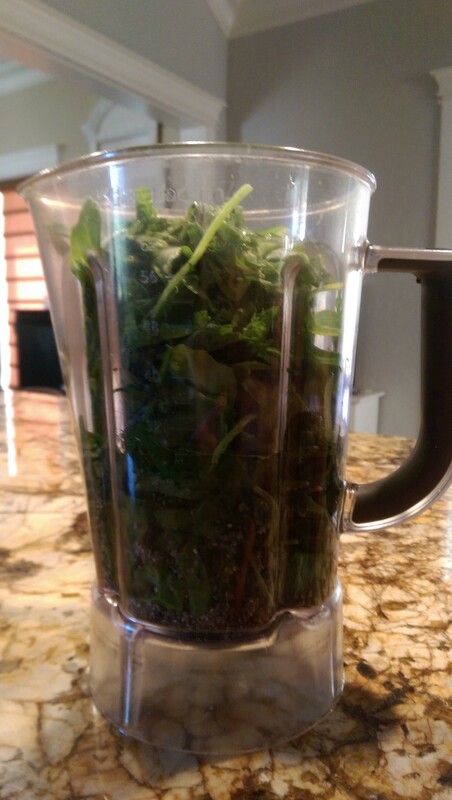 It is a green smoothie, after all. We buy the Costco frozen mix that has raspberries, blueberries and blackberries as well as frozen strawberries. These add yummy flavor, vitamins and lots of fiber. 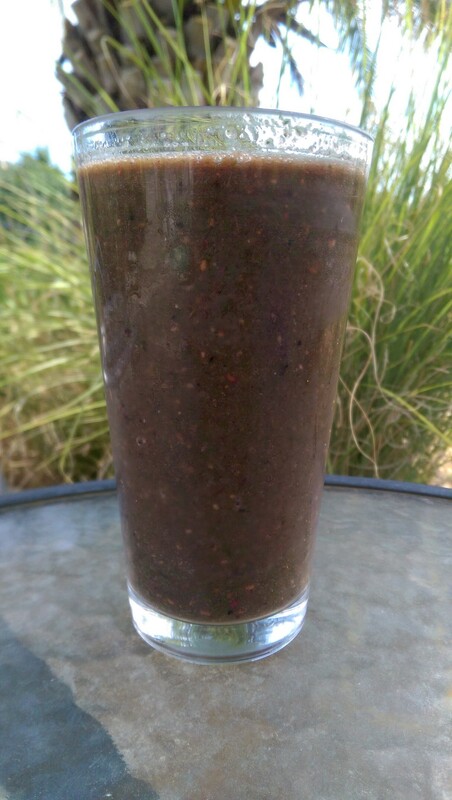 I’ll admit that you have to kind of chew your smoothie if you add too much of the raspberry, blueberry and blackberry mix. I like to add more strawberries to avoid excessive seeds. A word of advice: check the mirror before leaving the house to avoid sharing a disgusting smile. Been there, done that. 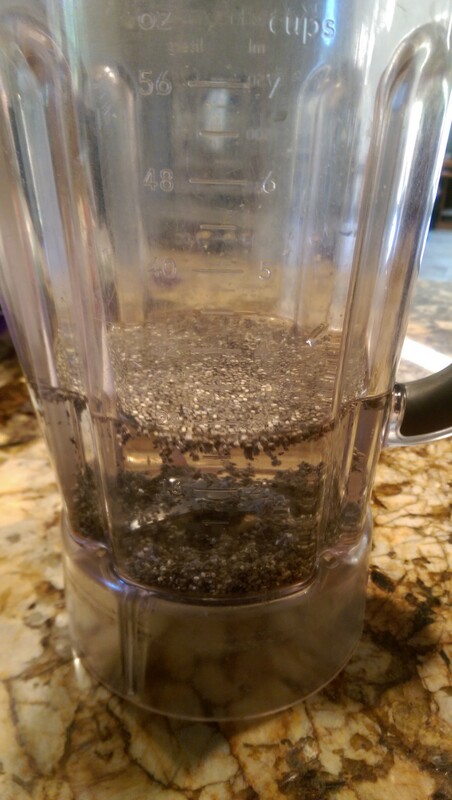 After blending those ingredients (adding more water if needed), and keeping the blender running, I add the next three ingredients. First, a couple of teaspoons of sugar-free orange flavored psyllium aka Metamucil. I know, I know. Actually this adds some flavor (to help cover up the handfuls of greens). Psyllium actually has more value than helping with regularity: it helps lower cholesterol and maintain healthy blood sugar level. Don’t forget that those 2 spoonfuls are for 2-3 servings. Next comes baking soda. What? You don’t put baking soda in your smoothie? There is all kinds of info out there about the benefits of having an alkaline body. Some might be hype, but just for the heck of it, I add a tiny bit of baking soda to our smoothie. You can’t taste it. The tiniest squirt of water flavor enhancer (Crystal Light in this case) adds just enough flavor to overcome the last of the greens taste. 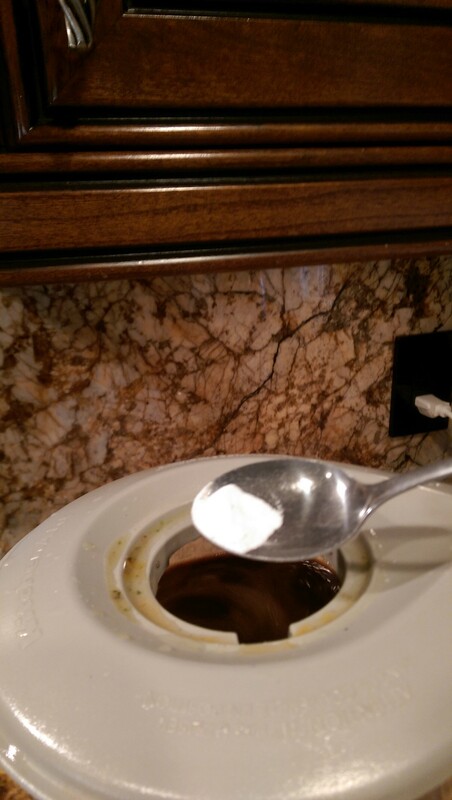 It is my secret ingredient. I don’t think that the flavor even matters. 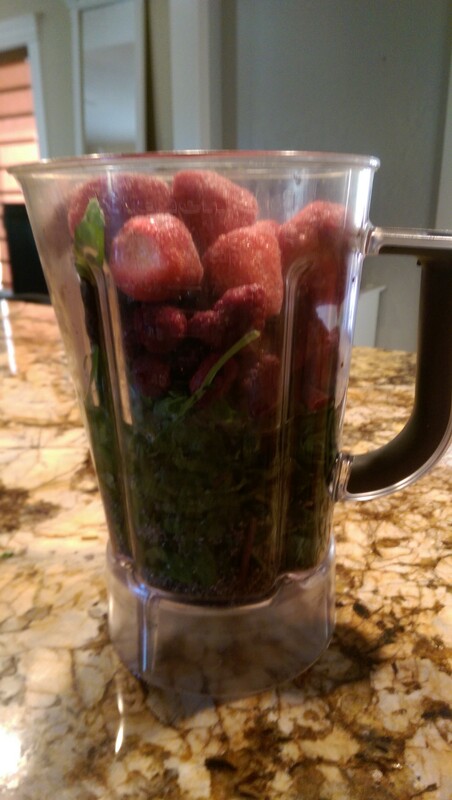 My hubby doesn’t use this when he makes our smoothies and I just think mine taste better because of this little flavor addition. Alright, I’ll admit that the red berries mixed with the greens actually make this more of an Olive green color. I would have said “Puce” but decided to Bing it to be sure. Did you know that “Puce” is actually a shade of pink? Who knew? 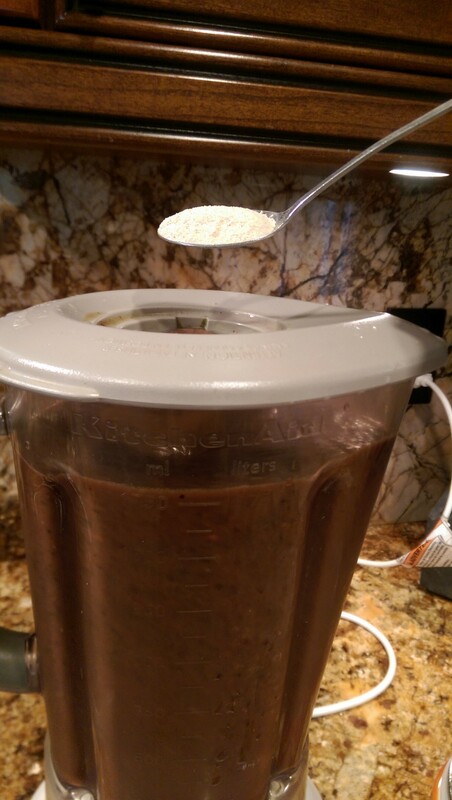 Yep…my hubby and I start our mornings off with this lovely Olive concoction and it keeps us going strong all morning long. My hubby drinks the ultra-large blue cup size and I go for the smaller glass. I imagine that our bodies are smiling on the inside because of the healthy, healthy stuff going in. Keeps me smiling on the outside, too…just as soon as I check the mirror and pick out the seeds!